What is X-Ring plus resilient ring technology? The original X-Ring as supplied on the Case Communications range of industrial Ethernet switches provides a greatly improved re-routing time in the event of a failure over spanning tree and rapid spanning tree. X-Ring plus resilient ring technology is provided with network operating system 2.0 and is an enhanced version of Case Communications ‘X-Ring’ technology, which provides high levels of resilience in industrial ring networks. 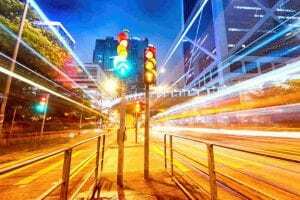 Typically re-routing times of 6m to 10ms can be achieved and networks can be as large as 250 switches per ring, with a number of topologies allowing Ring to Ring connectivity and dual head end operation. 1. Extended number of switches per ring Previously the maximum number of switches per ring were 50, with X-Ring+ its now possible to have up to 250 switches per ring. 2. Quicker re-routing time X-Ring + uses a new algorithm to reduce link failure detection time and to re-route the data faster. Typically recovery is 10ms, in a network a network of 250 switches. 4. Inter-connectivity For connection to ‘Head End’ switches we can use X-Ring+, Dual Homing and Ring coupling as well as more standard methods of interworking with third part products such as use of RSTP. The terminology has changed form ‘Dual Homed’ switches to RSTP. 5. Chaining of rings Chaining of X-Ring+ networks allows two rings to share a number of switches which can reside on both rings. 6. 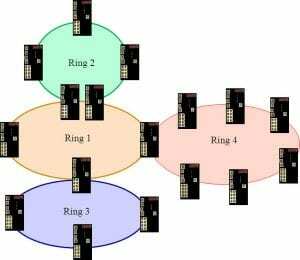 Easier Configuration With X-Ring+ there is no longer any requirement to configure a ‘Ring Master’ the network will automatically configure its own master, by selecting the last switch to be connected to the ring, as the master. 7. Is it necessary to purchase new hardware to run X-Ring+ Existing products can be upgraded to X-Ring+ via a software upgrade. 8. Is X-Ring+ compatible with X-Ring? X-Ring+ is completely compatible with X-Ring, via selecting a menu option to either run X-Ring or X-Ring+. X-Ring is supplied on the Case Communications range of Industrial Ethernet switches and provides an improvement over Spanning Tree and Rapid Spanning Tree.It provides a very rapid auto recovery if the network suffers a corrupt or broken link and prevent network loops.Case Communications X-Ring provides an Ethernet Ring between Industrial Ethernet switches, running at 10 Mbps, 100 Mbps or 1 Gbps.X-Ring can support up to 50 switches within a single Ring with a re-route time of under 30 milli-seconds, while X-Ring+ can support up to 250 switches, with a re-route time of under 10milli-seconds.The Rings geographic distance is only limited by the Fibre modules fitted to the switches so if using Single Mode SFPs capable of 140 km for example we could see a Ring of more than 35,000 km.When using copper then normal Ethernet rules apply.Multiple Rings can be connected using ‘Head-End’ Ethernet switches, and ring coupling. When an Ring+ network is constructed one of the switches in the Ring has to block the Ethernet loop, and this switch is known as the ‘Ring Master’.Previously the Ring master was configured manually and it was possible to have several ring masters, with the switch with the lowest MAC address assuming the role of ‘Ring Master’.This ‘Ring Master’ would send out an X-Ring BPDU (Bridge Protocol Data Unit) from one of its ports and this would travel around the network and be blocked by the Rings Masters second Ring Port.With X-Ring+ its no longer necessary con configure a switch as Ring master, all switches will pass the traffic through, but the last switch to be connected will automatically detect a loop and its port with the lowest MAC address will automatically block traffic, and that switch will become the Ring master.The switches will only send an X-Ring BPDU out when it detects a link up or link down on its own switch, hence there is no longer any packet continually travelling round the ring.The Ring Master sends out a packet onto the Ring to say, ‘Link Up’, and if this packet is received on the ‘Ring Master’ second ring port, the Ring Master knows there is a loop in the network and will therefore block the port which received the X-Ring BPDU packet. 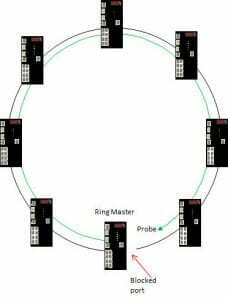 Why don’t we need to set a ‘Ring Master’ with X-Ring + ? As an X-Ring is not complete until the last switch is connected, by default the last switch in the network to join and complete the ring becomes the ‘Ring-Master’.Diagram 1 below depicts a normal healthy ring operation. 4. 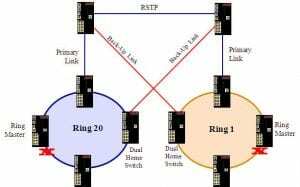 Ring master goes into port forwarding mode and becomes a transit switch As soon as the Ring Master unblocks its port it becomes a transit switch on the network, until such time as the link is repaired, when the Ring Master blocks its port. 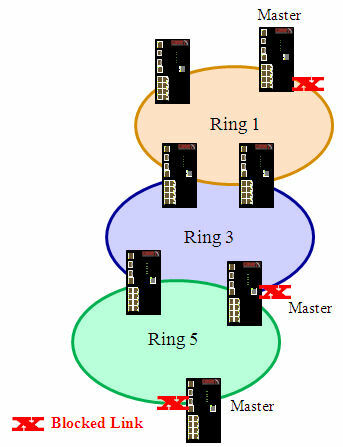 Diagram 3 below shows two rings (Ring 1 and Ring 5) interconnected, Note each ring has its own ring Master, and one switch is a member of both rings. As each ring has its own ID, the ports connected to those rings will be assigned their specific rings ID. 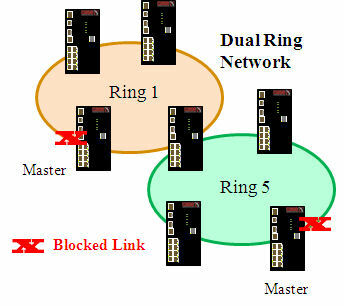 Diagram 4 below shows three X-Ring+ networks joined each ring with its own Ring Master. 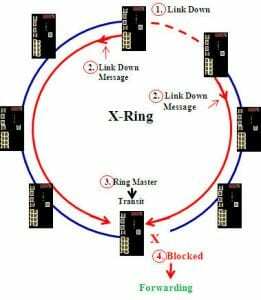 Notice here the Ring Master for Ring 3 actually resides on two rings, both Ring 3 and Ring 5, and at the same time it will block one port on Ring 3, as its working as Ring 3’s Ring Master. It's also possible to allow several switches to become part of two rings as shown in the diagram to the left, here we can see three switches forming part of two rings. As with standard X-Ring its possible to have two exit points on every ring, this is called ‘Dual Homing’ and an example of this can be seen below in the ‘dual homing diagram. It is possible to connect multiple rings, as can be shown below.Each Ring should be given its own unique Ring ID (value 1 to 99), with switches being able to sit on more than 1 Ring, as explained earlier.Within each switch you configure the different ring ID’s so for example ring 1 may have an ID of 2 and use ports 1 and 2, while the next Ring may have a Ring ID of 3 and use ports 3 and 4.